Never Multitask In The Kitchen. I've only got two hands. Most of those things were said to me, loudly, at one time or another. This time I was saying them to myself. I settled down to make a snack. The snack turned out fine, but it did spiral out of control a bit. It ended with my making something else that was much nicer than what I planned. I got on a tear. After piecing together a list of things that I had to do over the weekend, I got to the evening and was thinking about it. I had a lump of ginger in the fridge, and no plans to use it. "It's not getting any younger" I'm hearing from the next room. So I set about to making that crystalline ginger. Now that's not really a tough thing. I made it more difficult by trying to be slick, or to be thrifty. I wasn't really sure which when I did it. I didn't want a lot of simple syrup hanging around. It's when you boil water and sugar together and it's used in many recipes. You add equal parts, bring the mix to a rolling boil, and when it's clear and dissolved, you take it off the heat and allow it to cool. I only had 2 ounces and a bit of Ginger when it was peeled and sliced thin. Perfect! I didn't want a lot of that anyway. I'd simply cut back on the simple syrup. Er, well you know what I mean. I made 1/2 the amount. 1 cup each sugar and water. The problem is that when you make crystalline ginger, you have to boil that stuff for a good half hour plus. Or until tender. Or bored. Take your pick. I started stirring, backed the water down to a reasonable simmer and dealt with the interruptions. My buddy in Atlanta that I was having a chat with between spurts of doing "other things". Around 40 minutes of my fidgeting in the kitchen later, I noticed that that nice clear mix had started to go thick and cloudy. Like tar. It was still white, but it was rapidly solidifying. I hate throwing food out. That's a rule I have. I scooped the ginger out of the boiling sugar mix and put it on the rack to dry. Ok, so it has a bit more sugar coating than normal. I won't coat it with sugar at the end and call it done. The taste test was good, after all, how can you screw up ginger? But what to do with that white, now re-granulated, ginger sugar? The butter melted. I had about 1 cup minus a little coating on the ginger to mix up. I added a tablespoon of butter at a time. The butter bonded with the sugar making praline. Add more butter and up the heat back to medium. All the water had boiled off now, I was left with butter and sugar. By the time I was done, I had about 6 or 7 ounces of sugar with 3 tablespoons of butter added to the saucepan. That got shiny, and started to smell like caramel. The color was what I remembered from all that peanut brittle I have had as a child. I reached into the cabinet and tossed a handful of pecans into the mix. About 4 ounces. Mixing it all together, the scent of cooking pecans wafted over me. Rack, the McNab Superdog, became curious. I tossed about a teaspoon of baking soda in the mix and stirred it even as it foamed and rose. Pouring it on a sheet of aluminum foil next to the ginger that was now cooled, I had a big block of brown goo that would be light and crispy and taste well of nuts. So if you are thinking about trying this, there are plenty of recipes. The first time I ever made Peanut Brittle was in Mr Bates' 8th grade science class at Heritage Jr High School in Cherry Hill, NJ. We used Ehrlenmeyer Flasks and beakers and I used that recipe for decades on the original paper before losing it to the ages. The recipe is simple, and this makes a reasonable amount of brittle - so that you don't have it sitting around. proportions, or use espresso beans in 1/4 amount. 1/2 cup Pecans/Walnuts/Peanuts or 1 ounce of roasted espresso beans that are coarsely ground. To sauce pan, add the sugar and butter. The butter will melt and make the mix turn into toffee. If you are looking for proper Peanut Brittle texture, cook until the ingredients are smooth, shiny, and tan to brown. You will know if it is done by dropping a small drop of the mixture into cold water and it will crack - Hard Crack stage. At this point, add the nuts, and a teaspoon of Baking Soda and mix well quickly. 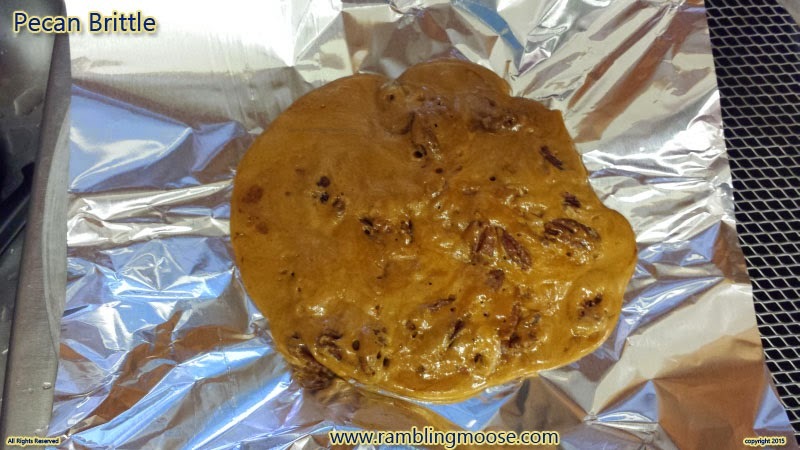 Pour the Peanut Brittle onto a sheet of aluminum foil to cool or onto a cookie sheet. When room temperature, you can shatter the peanut brittle into bite sized chunks with a couple raps with a spoon or butter knife handle.